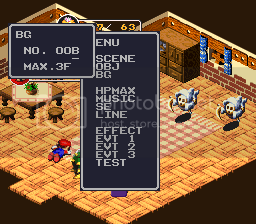 This is the Debug Menu. Not to be confused with the Debug Room many people know. First off, the code: C106AF80 is a Pro Action Replay code of course. Ok, now if you read on, you can see the features of what you can do with the Debug Menu. First what you'll need to do is enter in battle. Any battle will work but to make it somewhat easier to deal with, just get into some random battle. 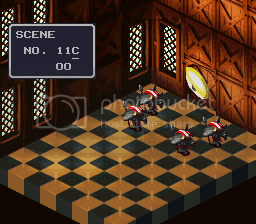 For my example I will go in battle with these enemies from Booster's Tower to start with. Ok this is important!! Do not press anything once you enter battle. Oh, and make sure the enemy doesn't make the first move first (unless you can survive the attack then nevermind). Ok make sure you don't press A or B or whatever. To activate the Debug Menu, simply press Start. The menu, as you seen in the picture, is what it looks like. I'll give a brief explanation of what each category is you see on the Main Menu. OBJ - view all the uncompressed sprites that are in the game! BG - change the background of what you're fighting on. HPMAX - this simply just refills your HP to the max of what it's currently. 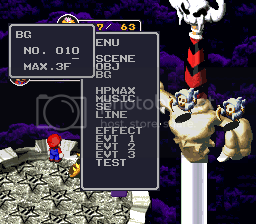 So it won't change it from like 120 to 999, only refills it back up to 120 if that's your max HP. MUSIC - listen to all the music that's in the game! SE - Abbreviated for Sound Effects, you can listen to all the sound fx that are in the game. LINE - this is used to measure the CPU usage of what it would use on the SNES. Another game uses this method but I'm not sure what game. Nothing to fancy about this. You can simply turn it on or off. 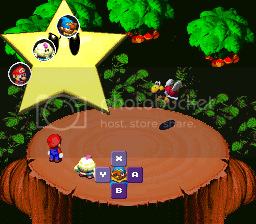 EFFECT - This is used to show the Background Animation of objects like the Star used for Mallow's Star Rain or the rock from Bowser's Crusher attack. 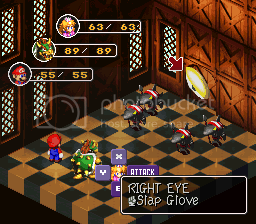 EVT 1 - takes you and your party to the first fight to save Toadstool from Bowser. Pretty funny if you use that when Peach and Bowser are on you're team. 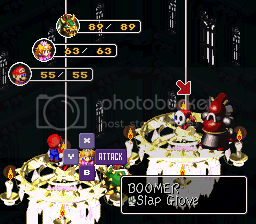 EVT 2 - takes you to the fight with Boomer at Bowser's Keep. EVT 3 - takes you right to Smithy himself. TEST - it simply just shows the animation of the flashes and lights when Smithy transforms into his true self. Then it just stops the battle of whatever you're in and you can't move after that. 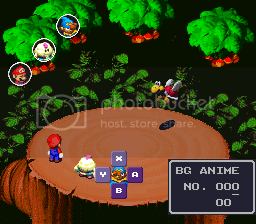 When you enter into the Scene mode, this is what it looks like when you first go there. *Note that the value last entered when used last will show up next time you go into this mode again. 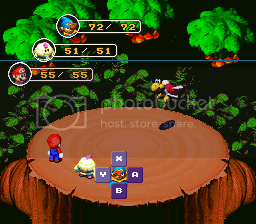 OK here are the controls basically: left moves you one space to the left, right moves you one space to the right, up increases the value digit, down decreases the value digit, A is to confirm, B to enter battle, cancel, or go back to the main menu. Values start at 0 for lowest and F for the highest. 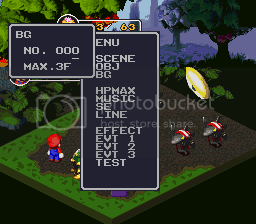 Try entering different combinations like 00F for a battle, 0A2 for a different battle, 10B for a different battle. 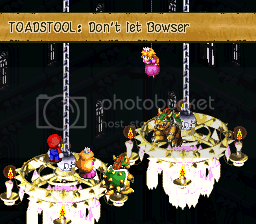 *Note* That not all combinations are battles, some can lead to scenes like Peach on Booster's Tower or when you first enter battle with Bowyer. 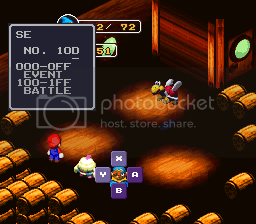 If you don't have the right members in your party at the time you select the battle, the game could freeze. And if you enter a value that shows no enemies on the screen, it means there is no enemies programmed into that specific value code. 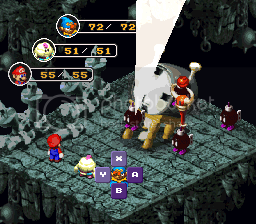 When you enter this mode, you can see all the uncompress sprites in the game. Controls follow: left moves you one space to the left, right moves you one space to the right, up increases the value, down decreases the value, B is to cancel, L is to decrease the sequence value, R is to increase the sequence value to view different animations for the sprite you are on. 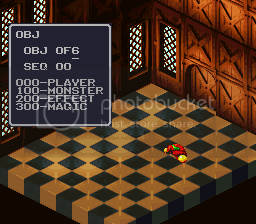 OBJ is the sprite, SEQ is the sequence number of that sprite for any different animations. Also it kind of explains the value range on the menu itself. 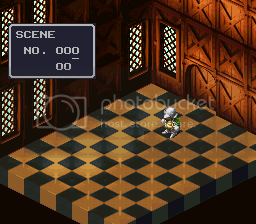 000 - 0FF shows all the sprites of characters in the game. 100 - 1FF shows all the enemies in the game. 200 - 2FF shows all the effects and items/weapons in the game. 300 - 3FF (or less) shows all sprites used in simple enemy magic attacks and also misc. sprites. This you can simply change the battle ground on which you are fighting on. Use my guide on GameFAQs yo easily find the background you want to fight on. You can fight on different areas from like the Forest to fighting Exor without his eyes! This can be useful if you want to rip sound FX from the game. 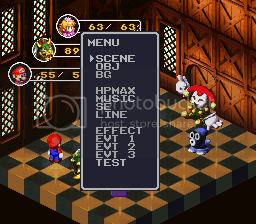 This mode measures the CPU usage in the game. Nothing too much to say about this mode. It's mainly used only for the debuggers and developers when making the game. The line can either be blue, as shown in the picture, or black depending on the background you are fighting on. 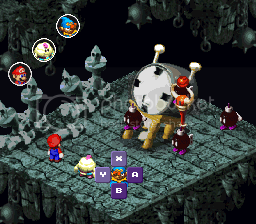 This is used to show the compressed sprites used in magic attacks like Peach's Mute Balloon, Mallow's Star Rain star, or Bowser's rock from his Crusher move. 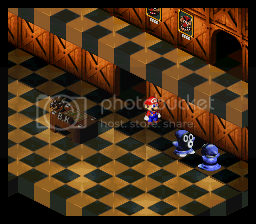 Some of these animations are fast so if you want a better look at them, slow down the frame rate of the emulator to take a better look. 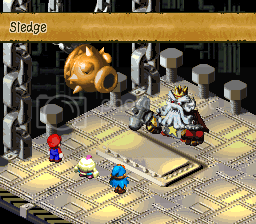 This simply brings you to the fight of when you first fight Bowser to save Peach. When enter in this mode, all of your current teammates will be in battle as well, as shown in the picture. 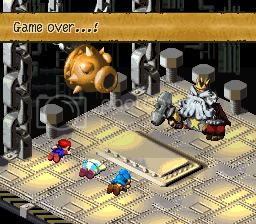 I thought it'd be funny fighting Bowser against Bowser, lol. Destroy the chain and watch your teammates just float while Mario and Bowser fall! This brings you and your party to the fight with Boomer. That's pretty much it. Entering here will bring you right to the last boss, Smithy. Make sure your party is strong enough to handle his Sledge attack because that's the first thing he'll do and if you aren't strong enough, you'll just get a Game Over like shown in that picture, lol. This simple shows the flashing and lights when Smithy is about to transform into his true form. Then after the big flash, it just slows down the CPU a bit with the animation and also you can't move after it so it's pretty pointless. This is an awesome debug menu.